'Slathered in chocolate.' These were the words given to the chocolateer tasked with decorating the Reaper's Perch. And it looks like a little romance was worked into the new design, as well. How lovely! The Chocolate Covered Reaper's Perch Skin can be used on the Reaper's Perch. The weapon's stats (power, power bonus, attraction bonus, etc.) are not changed. 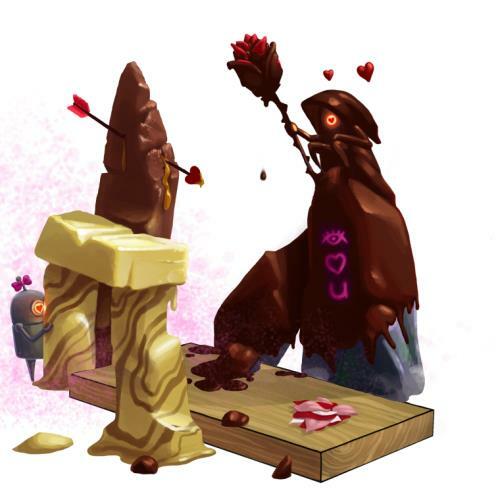 The Chocolate Covered Reaper's Perch Skin may be made available during the annual Valentine's Day event and can be traded on the Marketplace or through Give To Friends. 11 February 2013: The Chocolate Covered Reaper's Perch Skin was introduced with the Year of the Snake Festival. This page was last edited on 9 December 2017, at 10:20.